Last week we brought to you a review of a retro diver, the Huldra by AEVIG, this time let’s take a look at another one of AEVIG’s creations, a vintage inspired sport watch, the Valkyr. As with the Huldra, with the Valkyr too, Chip Yuen the founder and designer of AEVIG, brings us a beautiful composition of shapes, materials, textures and colours. A really interesting sport watch that combines clues from car racing with the nautical DNA of the bronze. There are six models in the Valkyr collection, three with a bronze case and three with stainless steel. 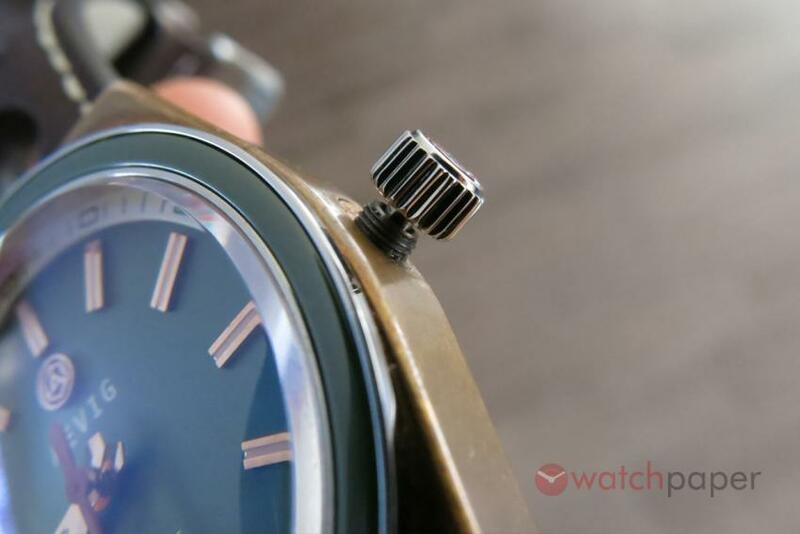 The bronze models will offer a choice of black, blue or green dial, while the stainless steel models will get either black, blue or brown dials. In this review, we’re going to look at the bronze model with olive green dial. There are many things that I love about this piece and the dial is one of them. The dominating colour is the matt dark olive green on which gold coated rectangular indexes are applied. Each one of them has a thin line on the middle filled with luminous paint. 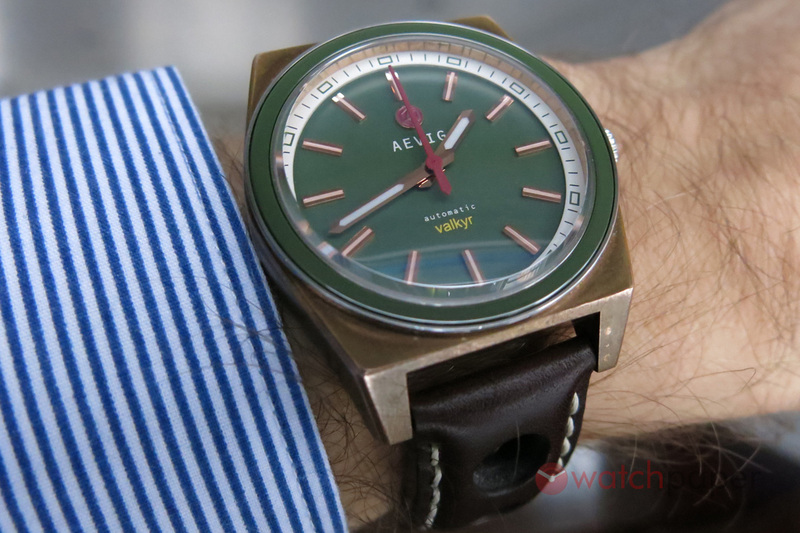 At 12 o’clock there is a dark red AEVIG logo applied which works particularly well with the dial’s shade of green. 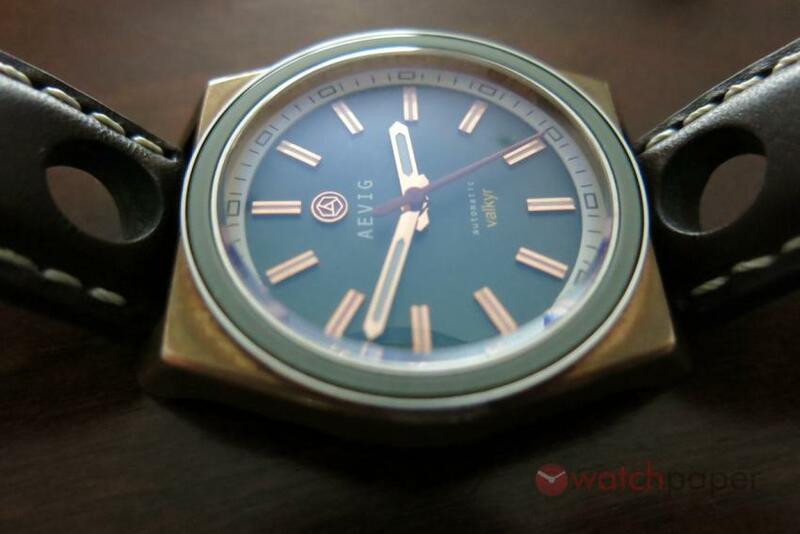 The minute and hour hands are gold coated, with their tip reminding the hexagon of the AEVIG logo. The mild slope of these hands, give them a nice volume that is really helpful in avoiding reflections interfering with readability. They are both coated with luminous paint. The second hand is the same dark red as the logo; it has an important role in creating a colour harmony with the dark olive and the gold. The white chapter ring is applied on the top of the green disk adding more volume to the dial. The black printed minutes marks and olive green rectangular indexes give the Valkyr its sporty allure. Like its diver cousin, the Huldra, there is no date function on the Valkyr, making the dial less busy and also less of a headache adjusting the time. A closer look at the green Valkyr dial. 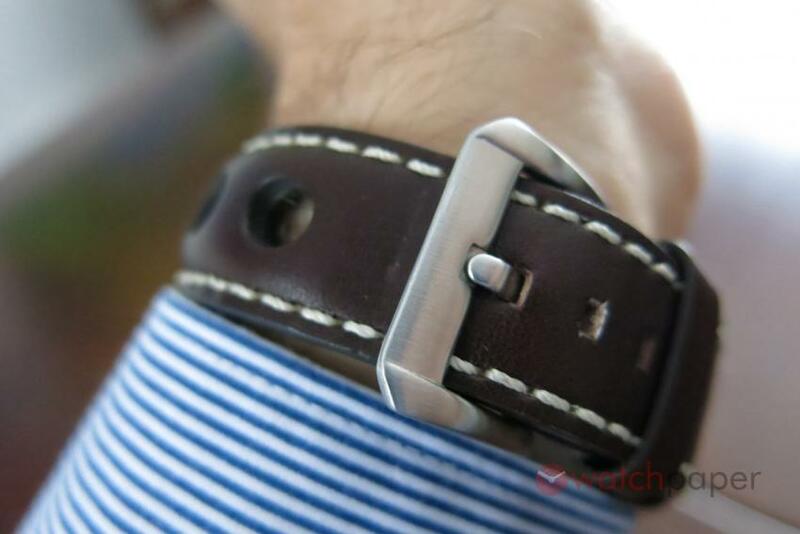 There is an in interesting detail that you will discover by taking a close look at the dial from an angle. Thanks to the domed crystal that will play the role of a magnifying glass, you can see fine bronze thread on the inside of the bezel. I’m not sure if this was searched during the design process or it’s a leftover from the manufacturing, but it is a cool touch that makes this dial even more compelling. 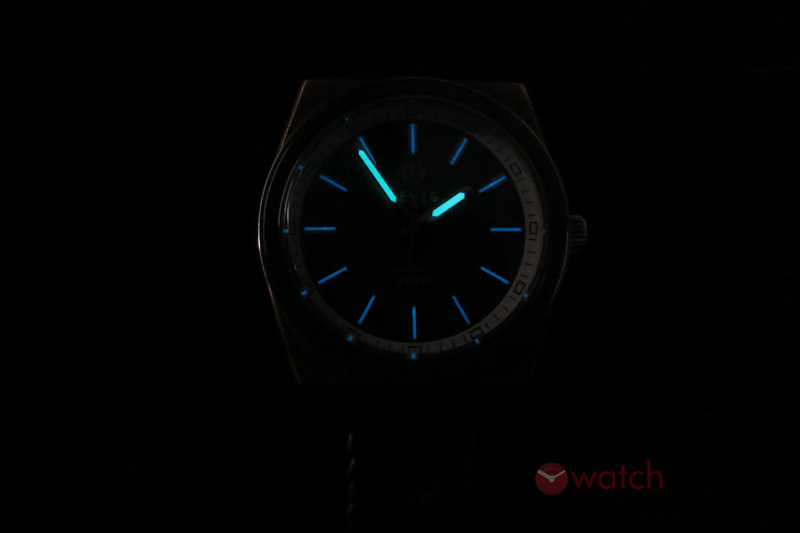 AEVIG Valkyr in the dark. While the blue lume of the indexes is quite pretty, I find them not to be very effective in darkness, maybe if they would have been slightly thicker, their glow would have been brighter. The hands, which are more important, are perfectly visible and when it comes to reading the time they compensate for the feebleness of the indexes. The size and proportion of the case make the Valkyr a very versatile piece that you can easily wear for a casual occasion or dress it up with a suit. 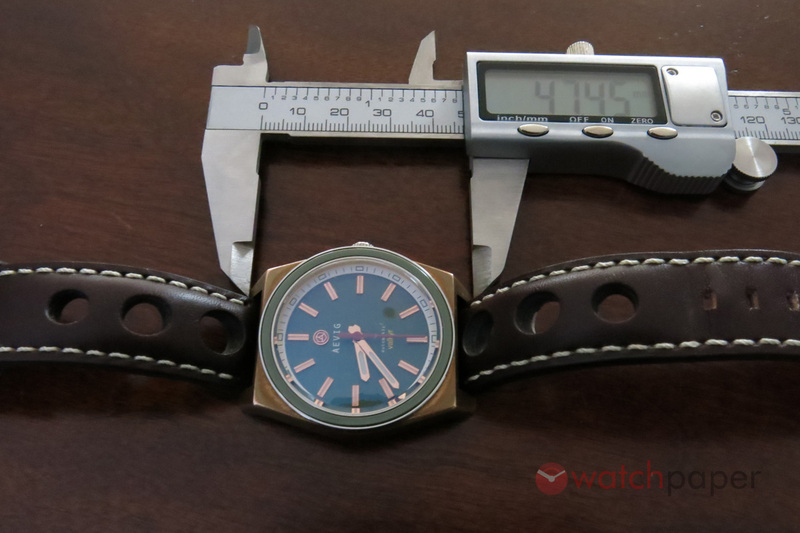 The bronze with time will develop a patina, that will make this watch unique. I’m particularly found of the shape of the case, which is a nice balance of sharp angles and mild, rounded lines. A masculine form that is not overly aggressive. I mentioned before the domed crystal, it is a thick double domed crystal that has an internal anti-reflective coating, sits above the bezel. 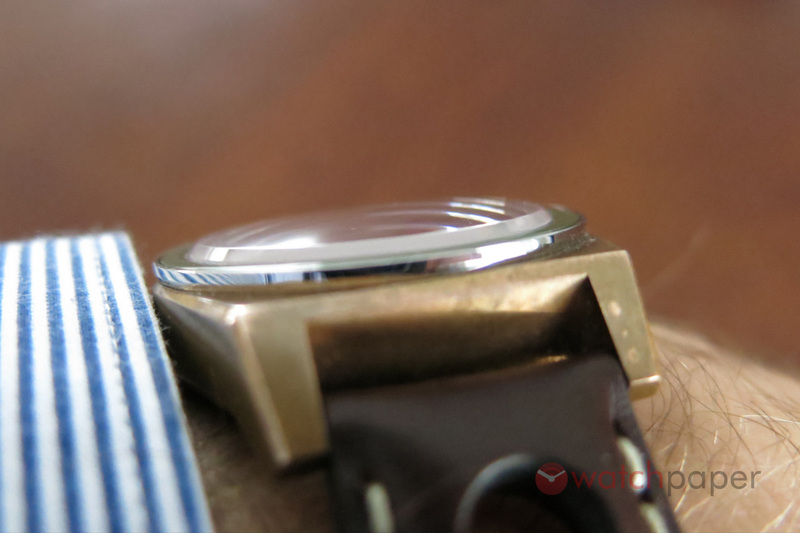 It is surrounded by a stainless steel bezel with a green ceramic insert, the same colour as the dial. 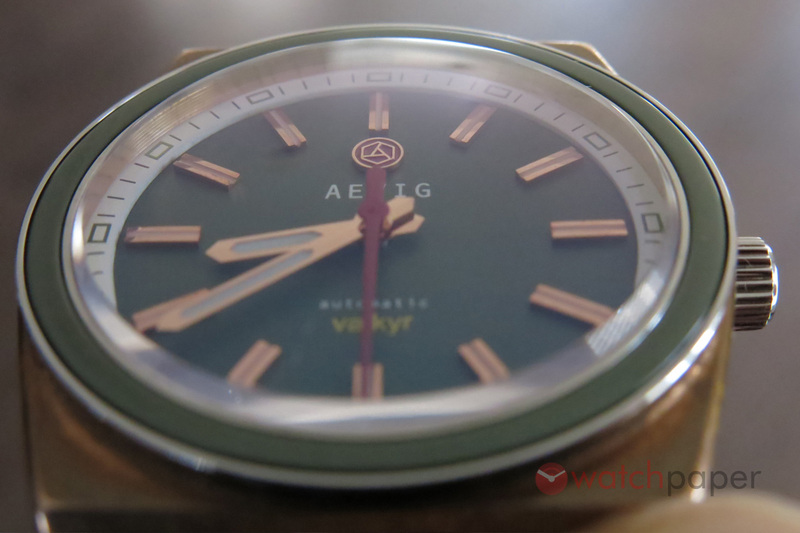 The stainless steel back of the Valkyr is engraved with the AEVIG logo. 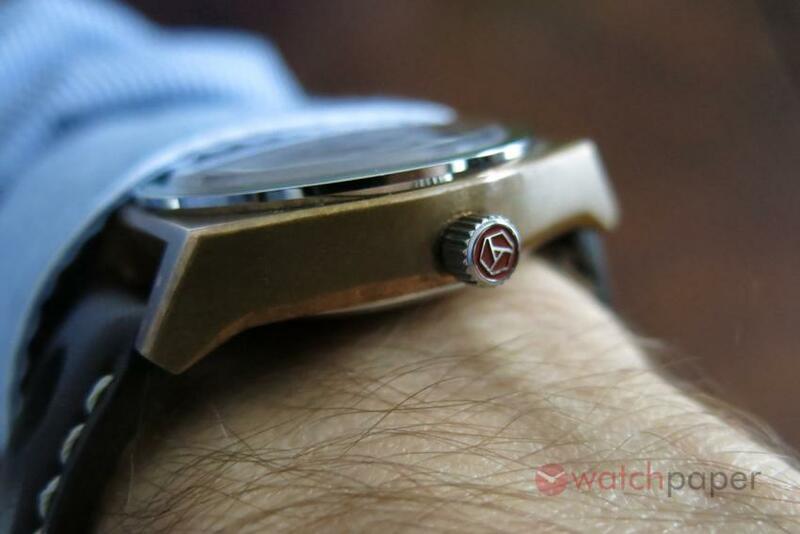 Stainless steel is also used for the screw-down back and crown, which are both decorated with the AEVIG logo. 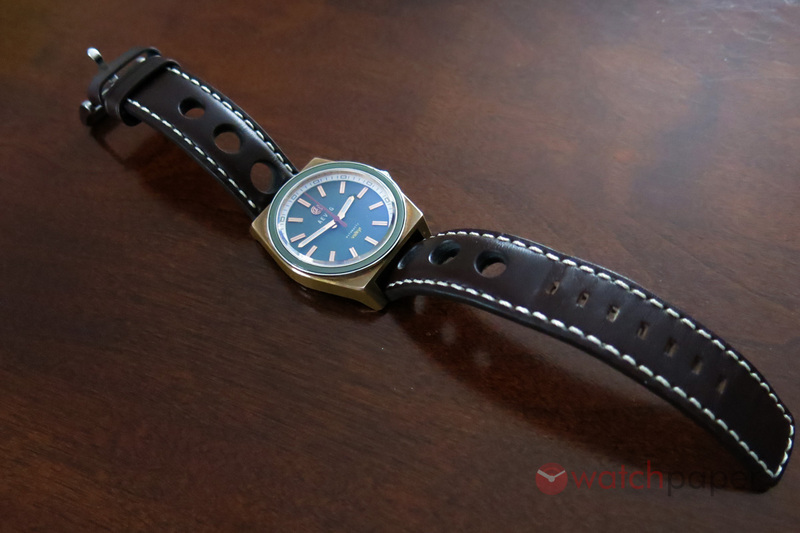 The large round holes of the thick brown rally strap, create a rhythm with the circular dial, while the rectangular holes for the buckle are somehow reminders of the rectangles of the chapter ring. As you can see, this was a not a quick pull from the designer, there was a lot of though that went into this. Despite all these details, if I would own a Valkyr, for sure I would start looking into playing with different strap options, just for the sake of fun and the 20 mm lug with should make this easy. 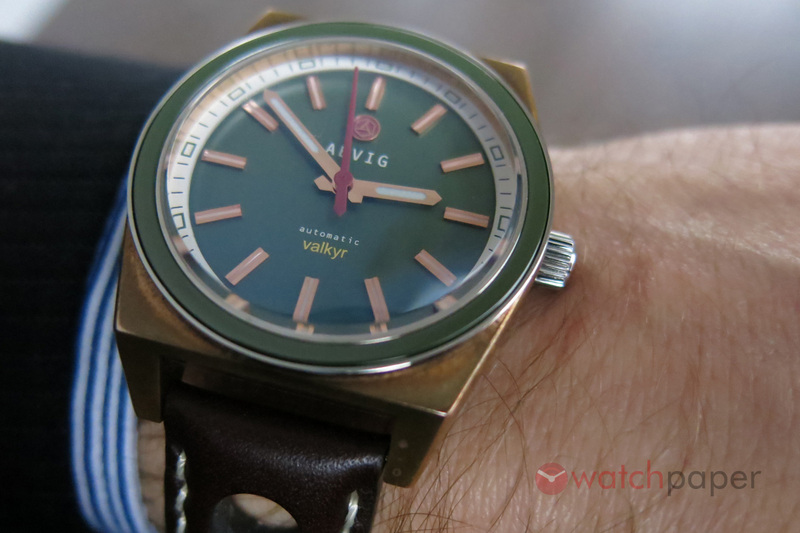 AEVIG Valkyr on the wrist. My entourage is used to see me every time with a different watch. While I was wearing the Valkyr, I was often asked what is that watch on my wrist? Is it the strap, is it the bronze, it’s shape, or maybe all of them? For sure this is not a watch that will go unnoticed. 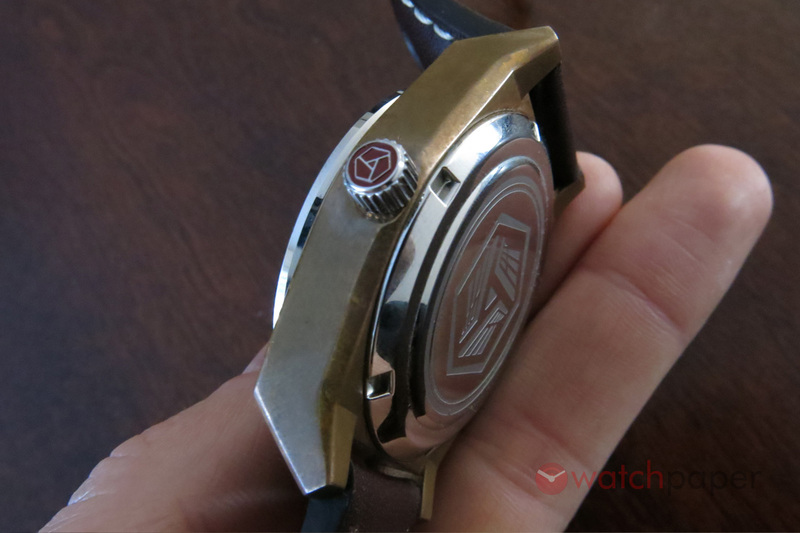 During the time, we spent together with the Valkyr, it would keep time according to the specs of the automatic Miyota, with the expected 40-or-so hours of power reserve. With my small wrist I had no problem wearing it and I could imagine it should work just as well for someone with a heftier wrist. While I have no reservations recommending the Valkyr Bronze with the green dial, you should check out the rest of the collection too, the other Valkyrs too are a prof of the good taste of their designer. The Valkyr collection is intended to be a limited edition of 100 pieces of each colour. They are not in production yet, AEVIG is still taking preorders, with the delivery being estimated for April 2015. It is a great occasion for you to take advantage of fantastic discounts on the regular price. 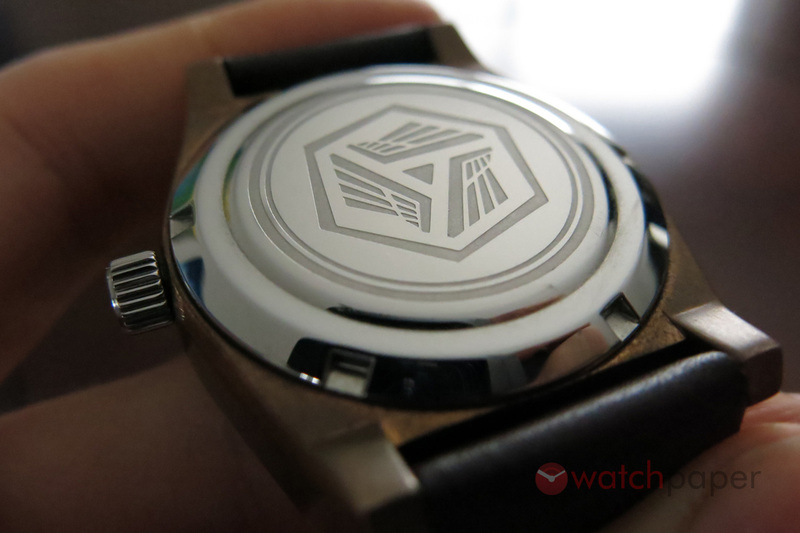 The AEVIG logo decorating the crown and the back of the Valkyr. Domed sapphire crystal of the Valkyr. The Valkyr is equipped with a screw-in crown.